Annoyed by the repeated assaults of spurious messages and confirmation prompts on your desktop? Would you like to get rid of Internet cookies or pesky "Are you sure you want to do this or that" questions? Don't let these or any other windows stress you, interfere with your productivity, or freeze your computer while you are away. Get rid of them with Buzof! 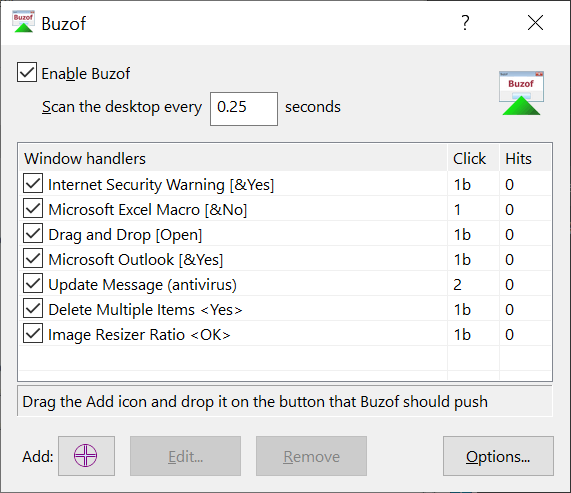 Buzof enables you to automatically answer, close or minimize virtually any recurring window including messages, prompts, and dialog boxes. 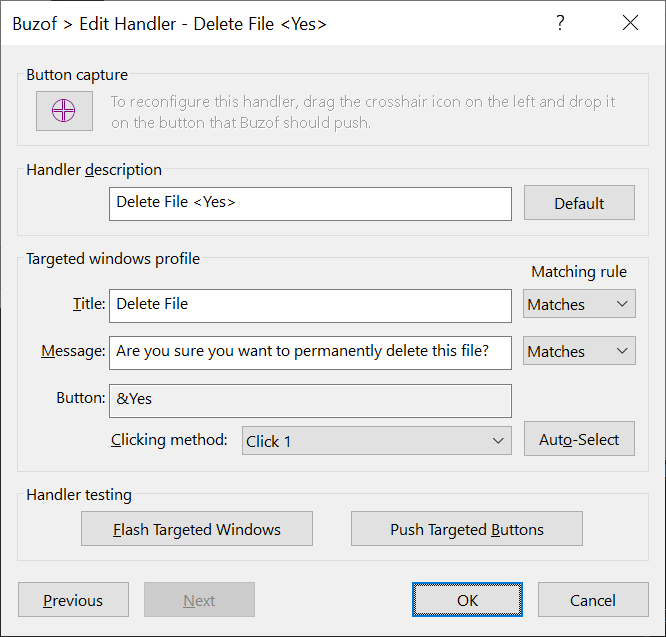 Simply teach Buzof how to click the button that you would normally click to get rid of the annoying window. From this point on, Buzof will periodically scan the desktop and take care of the window whenever it shows up again. Teaching Buzof how to click buttons is a snap; it can be done either by dragging an icon from the Buzof window to the targeted button, or by positioning the cursor over the button and pressing a hot key. Buzof is designed to handle many different situations that would otherwise need to be addressed individually by specialized software. In fact, Buzof handles all kinds of messages and dialog boxes so well that many users think that it was designed for their specific needs. Since all of the information is stored in a small data file, it is easy to use one machine to define a configuration that will be propagated to other computers in a lab or data processing center. Corporate users can benefit significantly from this feature in situations where it's important to configure many workstations in a uniform way. Stop wasting time with unsolicited messages that invade your desktop out of nowhere. Get Buzof! Gets rid of repetitive confirmation messages. Easy drag and drop user interface. Works in the background and doesn't waste desktop space. Click here for technical features. Accommodated the Windows 10 Improved Boot Up Experience feature. Updated the software for Windows XP/2003 backward compatibility. 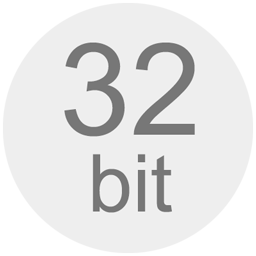 Resolved installer issues on 32-bit platforms. Updated the software for Windows 8 compatibility. Added a configurable updater to keep the program up-to-date. Updated the software for Windows 7 compatibility. 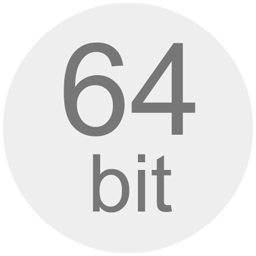 Created a 64-bit version of the software and updated the installer to include both 32-bit and 64-bit versions. The installer will automatically select the version matching your system. Added an automatic clicking method selector to the Window Handler window. Licensees using older versions of the product can upgrade to this major update at a discounted price. Updated the software to comply with Vista requirements. Previously, the program and its installer ran on Vista in compatibility mode. Now, they run on Vista in native mode, comply with UAC and other Vista technologies, and are digitally signed with an Authenticode certificate to ensure their integrity and authenticity. 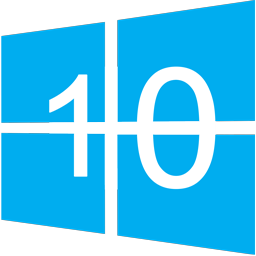 These major enhancements provide a better and safer experience when running the software on all supported Windows versions. Redesigned the application to use the Unicode standard and improve its Windows integration and multilingual support. Redesigned the installer to use Microsoft MSI technology and comply with recent Windows guidelines. Discontinued Windows 98 and Me compatibility to take better advantage of new Windows features. Upgrading to this major update requires a licensing fee for existing customers who are licensed to use older versions. Added support for Windows XP features. Added a switch to run Buzof when Windows starts. Added support for multiple Windows user accounts. Added the capability to import and export window handlers. Made the [X] button in the window title bar hide Buzof instead of closing it. Added Unicode support to improve multilingual text handling. Added an option to help locate targeted windows. A column displaying the clicking method. A column displaying the number of windows that have been handled. Context-sensitive right-click menus to edit handler properties. Handler sorting by column to organize the list. 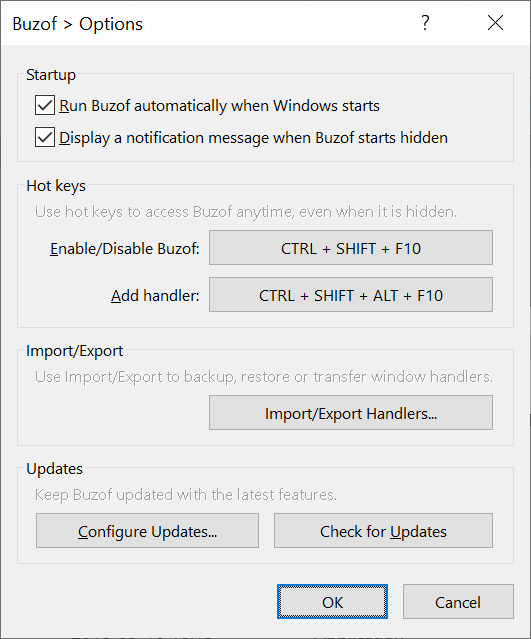 Added hot key support for enabling/disabling Buzof. Added regional settings support. Overhauled the help feature. Released the French version of Buzof. Added a feature to view previously handled windows, added a "Close" clicking method, and improved the coverage of existing clicking methods. Added automatic Click method detection, ignored disabled buttons, and improved some user interface elements. Added support for decimal scanning frequencies in order to provide more choices between 0 and 1 seconds, and added a default cookie eliminator handler for MS Internet Explorer v4.x. Added a new clicking method. Enabled MS Office 97 message box handling. Updated installation procedure and package information, added support to minimize windows, and move user-defined settings from the registry to a dedicated data file. Fine tuned the message handler to cover CleanSweep and the like, and added an import/export feature. Fine tuned the message handler to cover Schedule+ and the like, and saved message modifications more often. Fine tuned the message handler. Added a dragging option for low resolution and crowded desktops. Saved settings before rebooting, remembered window visibility, improved message handling, and added predefined handlers.